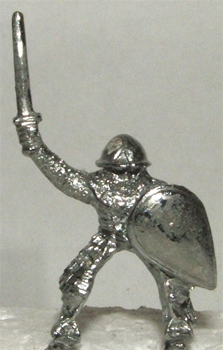 The only specifically Serbian Medieval line in 15mm is the Essex one, correct? And nothing for Bosnians or Croats in this era anywhere right? Thanks. I know why there isn't more diversity in 15mm lines, but that doesn't mean I wish there were more. Donnington has one too, buried in their Byzantine range. However, they do have some interesting figures in their Roumanians, Moldavians, Wallachians and Transylvanians – 1330 to 1504 range. Some of them might do for Bosnians and Croats. Donnington are a sadly overlooked range now. Nice simple castings that not only paint up well, but are available individually! My only problem with Donnington is the shipping – 40+ percent minimum. If not for that I would order more of their figures as they have some that I particularly like and a number of those less well covered lines. Ouch! I missed that. I admit that even though I have a few armies from them, I haven't bought anything since the company was sold. That is a bit steep.